Activa® CelluClay™ The Original Papier Paper Mache The ultimate air drying papier mache for all creative arts & craft projects! ACTIVA® CelluClay™ Instant Papier Paper Mache is a low cost, recycled paper medium which mixes easily and molds quickly. 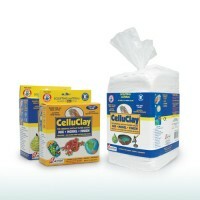 CelluClay™ is very easy to use, simply add water and it air dries! This instant paper mache i.. It is 100% safe and non-toxic to all. Activa’s new Fast Mache will allow larger craft projects to be completed faster than ever before! 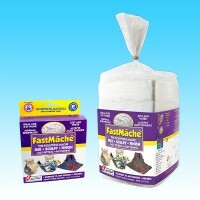 Minimal shrinkage makes Fast Mache more versatile in its uses. It has a heavier and tougher finish than the original which enables Fast Mache to be ideally suited for 3-D work and is perfect for all of your school craft project needs. This paper mache works ver..
Activ-Wire Mesh is provided by Activa Products and is the perfect structural support for all project ideas. Activ-Wire Mesh is a unique material for direct wire sculpture and an amazing art and craft material. It is a perfect fit for the Activa sculpture and floral lines as it adds support and its uses are endless! 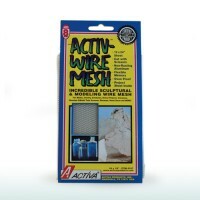 Activ-Wire Mesh is easy to cut with household scissors and is non rusting making..